“Abracadabra” – An Unorganized Mind/Musings and Memories with Photos *To view the complete Menu: Click on menu then use the down arrow to scroll down the Menu Categories. I used to have a very busy custom paint business. I did a lot of various paint techniques on walls so I called it “Wall Art”. I did a lot of glazing (a subtle, shiny finish with a translucent stain; usually done to give a wall an antique look). I also did what was called faux painting, using different colors blended to give a wall more depth and/or make it an “accent wall”. I loved doing murals and did a few of these as well. Towards the end of my time in this business I got into transforming plain, vinyl garage doors into looking like a metallic (often copper) door instead. A wood-look was also a popular choice. I am going to describe what my three shots (photographs) would look like in the steps I took to complete this job. (Of course if I really did a step-by-step process in photos there would be many more than just three. This is assuming I have already been hired and talked with the client to see what they want. You see a photo of my car, yes, I used a car often when doing this and it was loaded to the brim with paint cans, metallic paint jars, a can of denatured alcohol, paint thinner, rags, canvas tarps to protect the driveway, masking tape and a ladder sitting on top of everything else. The ladder had to be wedged between the two front seats and extended up to and resting on the dashboard. It then went clear to the back door, or “hatch-back”, that lifted up in my SUV. Quite a sight for sure! The next photo would be of the tarp laying spread out over the drive-way, with part of it under the closed garage door. Masking tape would cover the trim and there I would be on a ladder applying the accent black paint with a rag over the dried, metallic paint covering the vinyl garage door from the day before. I am blending in the dark color to give it a burnished look. There is paint all over my shirt and pants as I wear my “paint clothes” when I paint so I can wipe my hands, often, on my clothes which is very handy. (I look pretty tired at this point. Tap, tap, tapping the black over the metallic paint is very laborious and tiring. The third photo is me standing in front of the finished product. All signs of the work are gone, everything is cleaned up and the car looks like it did in the first photo. I have a big smile on my face as it always was such a wonderfully satisfying feeling to finish a job, get paid and be done. 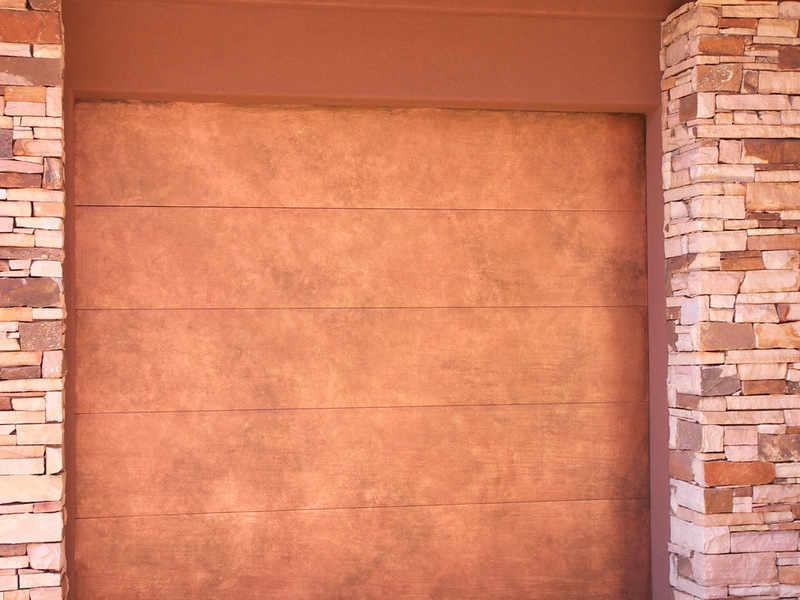 I never lost the wonder of how you can turn a plain, white vinyl garage door into a stunning, copper-look door in a few day’s time. Thanks, Sonya. I have a picture of those clothes somewhere. Need to dig it up and post. They are very multi-colored! I LOVED doing that business and think I’ll try to do a few jobs now and then again. Thanks for your comment!